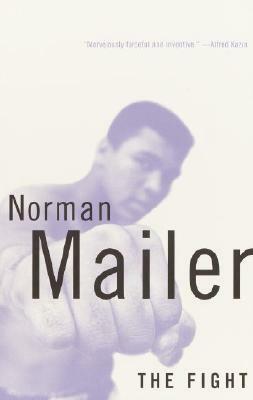 With the exception of some true crime novels, and a few books by Norman Mailer, I don't often read nonfiction lit. In fact, when I found Five Days at Memorial and added it to my, "To Read" list, I thought I was picking up some type of historical fiction. 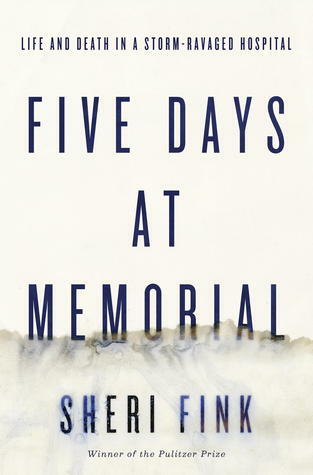 The fact of the matter is, immediately after you start reading Five Days at Memorial, you realize the exact opposite is true. This Pulitzer Prize-winning tome, written by Sheri Fink, is actually a gruesomely true tale of the events that happened at Memorial Hospital in New Orleans in the aftermath of Hurricane Katrina. From the onset, I was riveted. Depending on where you lived during Hurricane Katrina, your experience with the superstorm may range from extremely personal to a distant memory. Regardless, Five Days at Memorial will challenge your perception of one of our nation's biggest disasters and leave you wondering, "What would I have done?" Interested in more of what I'm reading? Let's be friends on Goodreads! I can't be the only one who has those days where I don't want anything clinging to my body. You know what it feels like: your hair is a day past dirty, you had a late night and you're guzzling coffee like caffeine is the very essence of your being, and if you have to wiggle into a pair of skinny jeans it will be the absolute end. I thought I had hit gold with this Gap pair, but they were just too nice and comfortable for me to truly destroy the way I needed to. I had started thinking it was hopeless, but I went with a friend to Urban Outfitters, and found the holy grail of boyfriend jeans in the men's section. Levi's 508, light wash with some distressing already implemented - I was in heaven. I even added a few more rips and tears to get the perfect shredded look to them, and I have to stop myself from wearing them every single day. Have you tried shopping in the men's section for jeans? What do you think of the new baggy, boyfriend look? I held this in for much longer than I intended. I started to write this, decided I was using too many adjectives to describe the best sandwich you will ever eat in your entire life, then rewrote it and rewrote it, but it is just not fair for me to keep this sandwich from you for another weekend. I cannot do it. Last Saturday morning the Husband and I were wandering around the house, doing house things. Cleaning the pool pump, sorting mail, mopping the floors... all of the things you do to make it look like you didn't just throw your briefcase on the floor and eat chips straight from the bag all week. Ahem. It came to be about 11:30, and we realized we hadn't eaten. We are brunch people. We are food lovers. This was a sin. I was several mugs of coffee into my day, and I was feeling adventurous. I opened the fridge and saw... possibilities. For dinner earlier that week, I had made a modified version of these Steak Fajita Stuffed Baked Sweet Potatoes (which were delicious, trust) with chicken instead of steak, just using all of the same seasonings. They were heaven on earth, and I had loads of shredded, savory chicken left over, plus two sweet potatoes that would surely wither and die if I left them in my fridge for a moment longer. 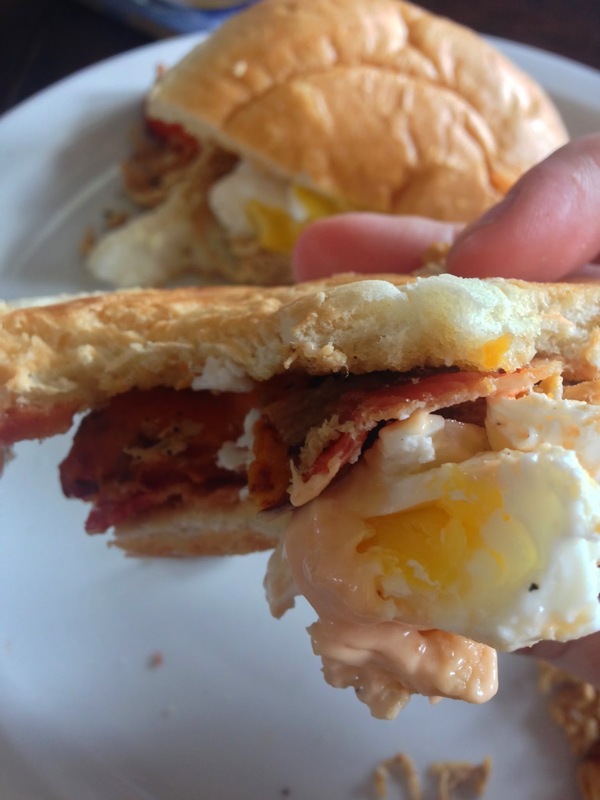 That, plus eggs, bacon and a homemade chipotle mayo = sandwich nirvana. This is the light of the morning and my iPhone camera. This is un-edited reality. So, how do you create your own? I'm here to guide you into perfect sandwich perfection. I used "perfect" and "perfection" in the same sentence. I am serious. - Mix to your liking. Add more or less of each ingredient to taste. This will keep in the fridge for at least two weeks, but it probably won't last that long, because this stuff tastes great on everything. 1. Wash your sweet potato and cube into small chunks. Coat a skillet with oil and add potatoes, seasoning with salt and pepper. Cook all the way through. Set aside. 2. If you're starting from scratch with your chicken, mix the spices/seasonings together and place your chicken breast/tenderloins in the mixture. Make sure they get really coated - you can even let them sit in there for a few minutes while you pour yourself another cup of coffee. 3. Fire up your cast iron skillet with a little bit of oil, and cook the chicken all the way through. Shred and set aside. 4. Cook your bacon however you cook your bacon. Oven, skillet, microwave... whatever. I lay down paper towels on a plate and zap slices in the microwave. It depends on your microwave, but I do 4 pieces for 4 minutes for crispy bacon. 5. In a pot, mix 2-3c hot water with 1/2c vinegar and bring to a gentle boil. Crack two eggs into the water and allow them to poach. Cook to your liking. (Husband's were more cooked through than mine - I like runny yolks.) The vinegar isn't absolutely necessary, but it helps keep your whites together while your eggs are tossing and turning in the water. 7. Smear generous portions of chipotle mayo on both sides of your bread. On one side of your bread, stack sweet potato cubes and top with shredded chicken. Add your poached egg on top of the chicken. On the other side of your bread, layer bacon pieces. 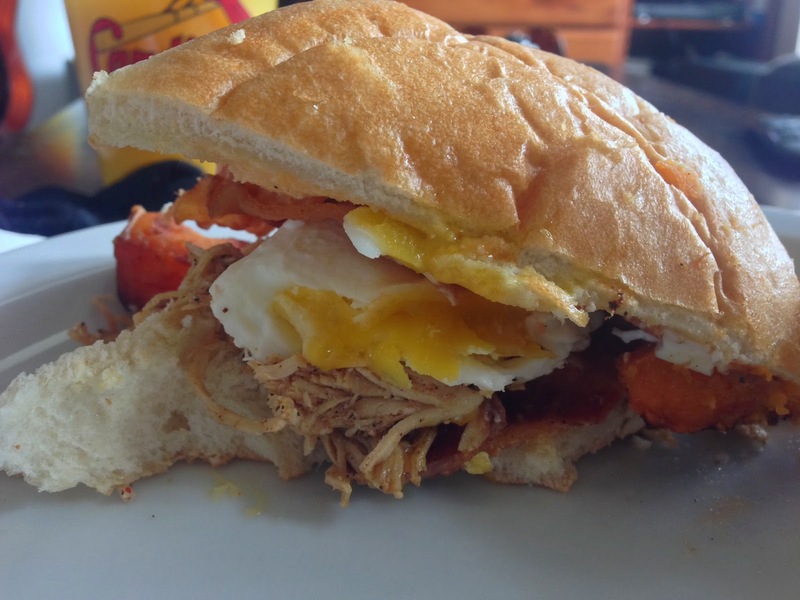 Put your pieces together for the best sandwich you have ever eaten. No, there are no green things on this sandwich. I thought about it, and decided against it. You can do whatever makes your heart happy. So go on, make your heart happy.